Okay. This week we'll talk about which types of flooring will perform best in the laundry room or mud room areas. 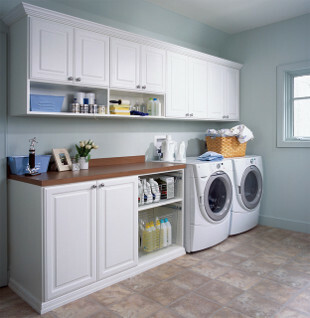 Of course most laundry rooms and mud rooms can be areas of high wear and high moisture. Mud rooms will get the wear and tear of people traipsing in from the garage with all kinds of foreign matter on the bottoms of their shoes. Sand, grit, oily residue and all manner of contaminants. This can cause much damage to any existing floor in this area. So we would need a floor that can stand up to abrasives and high wear. Also, when coming in from outside, we can bring in water or snow depending upon the season. So this floor must be able to accept high moisture without being ruined. Some of the best types of flooring to be used under these conditions are: ceramic tile, vinyl flooring, laminate flooring (some limitations apply) and even hardwood (probably not the best choice). Let's take them one at a time shall we? 1. Ceramic tile: Probably the best choice. It's durable, high wearing, extremely long lasting and almost (and I said almost) indestructible. It is impervious to water, hard to scratch, won't gouge and really won't wear down either. Ceramic tile is meant to be a permanent floor. Some ceramic floors in the middle east are thousands of years old! The weakness in a ceramic floor is mainly in the grouted area. With enhancements to the grouting systems this is really no longer a weak link. Epoxy grouts resists stains and water unlike standard grouts. There are also some newer grouting systems that are easier and cheaper to use than epoxy grouts. Also, ceramic tile can chip or crack if something heavy or sharp is dropped on them. Pricing can be prohibitive too. But all in all a great choice for mud rooms. 2. 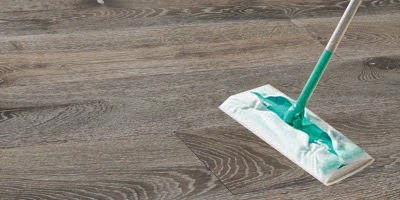 Vinyl flooring: The absolute best flooring for water resistance. Because vinyl sheetflooring is one solid sheet of flooring, no water will penetrate of get through the wear layer on a vinyl floor. So spill all the water on it you like because water is really no issue (now too much water can travel to the outer edges of the room and creep up under the shoe molding and penetrate into the sub flooring below which will cause issues but you would need lots of water standing for a long time for this to happen). Most new vinyl flooring is very scuff, tear and gouge resistant unlike the old vinyl flooring momma used to have. Vinyl flooring is not as tough as ceramic tile but pretty darn tough anyways. Plus, vinyl flooring will not last as long as ceramic tile but will still last for 10, 20,30 and even 40 or more years which is plenty enough for most people. Pricing is better than ceramic tile and lots of new technology in styling will give you great visuals. 3. Laminate flooring: Hard, durable, somewhat water resistant and installer friendly. Laminateflooring can take a hard hammer blow and not indent (unlike hardwood which will indent or vinyl flooring which will show the dent from the sub floor underneath or ceramic tile for that matter which will crack or shatter) but if you were to drag something sharp over the surface it will scratch. Lots of flooring salespeople will tell you that laminate flooring is almost indestructible but that just isn't the case. Laminate flooring is resistant to scratching but it will still scratch and once scratched it really can't be fixed but must be replaced at that point. 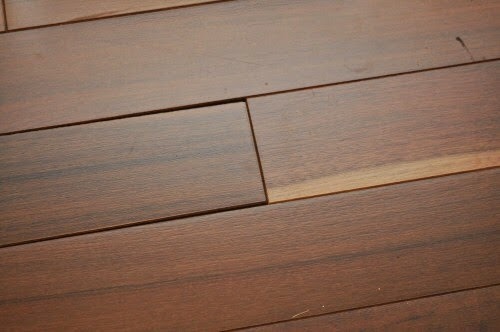 The wear layer on good quality laminate flooring will last a long time (unlike cheap grades of laminate flooring). Water can also be an issue with laminate floors. They can take light water but heavy water can start to work through the sides of the boards causing swelling, warping and peaking of seams. Wood and water don't mix and laminates are made with wood byproducts. Laminate floors can be installed easily by most homeowners and easier still by professional flooring contractors. 4. Hardwood flooring: not the best choice for areas with high wear and moisture but can beserviceable if maintained correctly. Walk off mats are essential for this area. Taking off your shoes before entering the wood area itself is best. No water or very low water is also best. So if you take off your shoes, wipe your feet on the mat and keep the floor clean, wood flooring can be used here (in mud rooms not laundry rooms). 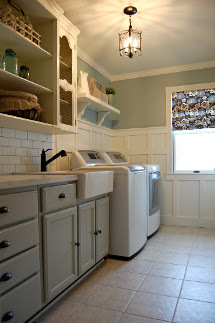 Flooring for laundry rooms is similar when it comes to flooring choices. Everything written above will apply to laundry rooms except hardwood flooring. Hardwood floors really should never be used in a laundry room because of the potential for flooding from an over flowing washing machine. This risk is not important for mud rooms but as you can imagine is critical for laundry rooms. An overflowing washing machine or laundry tub will just ruin a hardwood floor (probably a laminate floor too). So, no hardwood or laminate flooring for laundry rooms. Vinyl flooring is probably the best choice followed up with ceramic tile. The newest hot trend in flooring is vinyl plank flooring which can be used in these areas. While it is impervious to water it does have joints between each individual plank that can allow access for water if left standing long enough. Like peel and stick tiles. They have joints every 12 inches and water can seep into them. Vinyl plank flooring is in essence just vinyl tile that is shaped differently. Instead of 12" squares they are shaped into planks (yes I know the composition of the planking is different but I said "in essence" they are the same). And leave the rubber flooring for the gym, ok? Hardwood flooring is beautiful, durable and long lasting. Most hardwood flooring is designed to last a lifetime in your home if you take care of it correctly. So, how do you take care of a hardwood floor? First of all, hardwood flooring is a natural wood product with a wear layer on the surface. Some people think with the newer, harder finishes (aluminum oxide infused, UV cured urathanes) that are applied to the wood that they can just walk all over them without a care in the world. I don't know of any flooring (maybe concrete.....lol) that this is true of. Okay, ceramic tile is extremely tough to ruin also but we're talking about wood here. come. 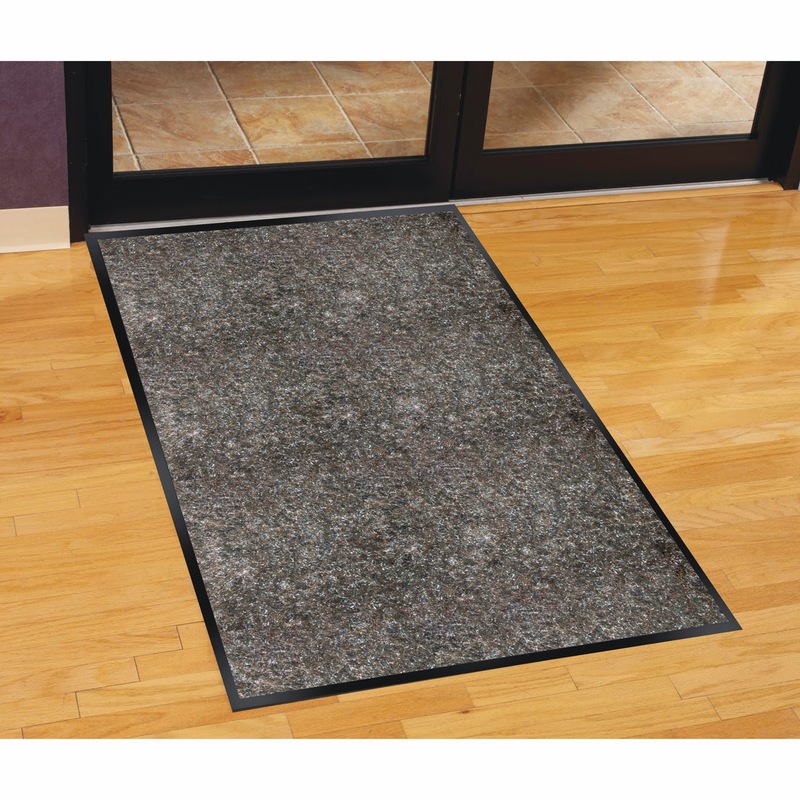 A walk off mat should be located at every doorway leading to the outside, whether that's a garage door, entry door or a door wall leading to the deck. Wherever dirt, sand or other abrasive materials are located that could potentially lodge into the bottom of footwear (and hence scratch the surface of any hardwood flooring), this would be the place to set a mat. Anybody coming in from the outside should be encouraged to wipe their feet on the mat before entering onto the wood flooring or better yet, to take off their shoes. Anybody who has a hardwood floor and has scratches from shoes will know what I'm talking about. Better to be safe than sorry. humidity levels). Wood flooring is still a living (kinda....lol) breathing product. It will expand and contract with differing humidity levels. I've written a blog on this in the past so I won't go into detail here but suffice it to say, wood will contract in the winter with dryer air in the home and will show tiny gaps between individual boards. This is not a defect of the flooring but is a natural reaction to lower humidity levels. The wood will expand and close the gaps when the humidity rises. Either add a humidifier to the home or wait till spring! Another fact: wood and water don't mix! People like to keep their floors clean and spotless (at least some of us do. lol) but resist the urge to wash your floors as if they were a vinyl floor. Since hardwood flooring is being installed so ofter in kitchens these days (where we cook and drop stuff on the floor. Yikes) people will just grab their mops and have at it. Don't do it. Wood floors are not meant to have that amount of water applied to them. Just spot clean with a damp (not wet) cloth and wipe dry. If you would like to clean the whole floor then a swiffer that cleans with hydrostatic electricity works best for dirt, dust and other dry type particles. Some hardwood flooring manufacturers make a spray cleaner designed specifically for wood and laminate floors which can and should be used (ideally no water). We here at Dover Floor Covering carry Mohawk hardwood flooring and they make their own hardwood flooring cleaner. If you must use water then you would need to squeeze out the excess water from the mop and it should have no more water in it then the clothes in your washing machine after the spin cycle would have. urethane finishes applied to most hardwood flooring products these days is the same or similar, differing wood species themselves are vastly different in hardness. So you may buy a Cumaru hardwood floor (which is extremely hard and dense, almost 3 times as hard as red oak) with an aluminum oxide infused, UV cured finish and it will resist surface scratching the same as the afore mentioned red oak floor. So the two hardwood floors will perform about the same when it comes to surface scratching and wear through. What you gain from a harder, denser floor like Cumaru or Brazilian Cherry is dent resistance and deep scratch resistance. The harder wood will be tougher to gouge then it's softer counter parts. 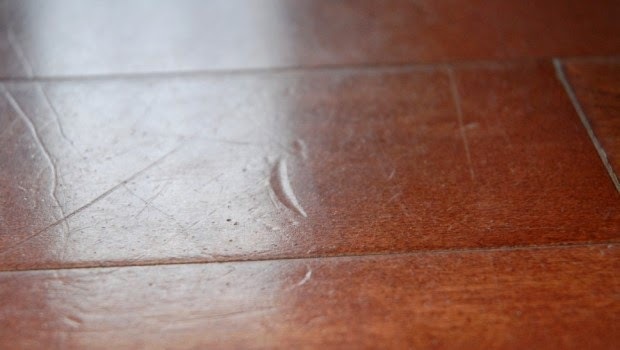 Always use floor protectors under any piece of furniture to protect your hardwood flooring from surface scratches.